Enter Conversano, go to Acquaviva Castle of Aragona, keep its position on the right, over the rondo, continue straight for about 100 meters and turn left for Monopoli, Triggianello, Montepaolo. 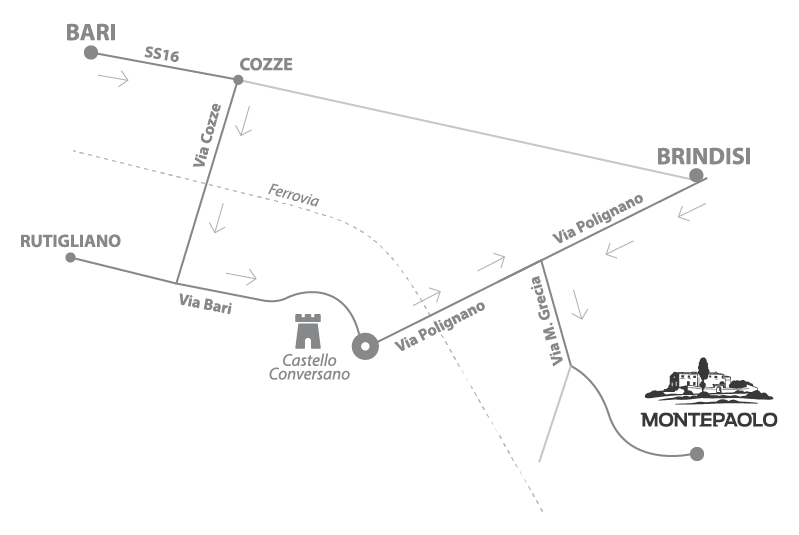 After 500 meters turn left until you reach the level crossing, over at the crossing turn right and continue for 2 km following the signs “Masseria Montepaolo”. Take the provincial Polignano-Conversano, before the level crossing turn left entering the road to Monopoli. At the STOP, turn left, after 50 meters, turn left as indicated by the sign, until the level crossing, over, at the intersection turn right and continue for 2 km following the signs “Masseria Montepaolo”.